Peterborough Phantoms produced their best yet to shut-out the highest-scoring team in the English Premier League last night (November 20). 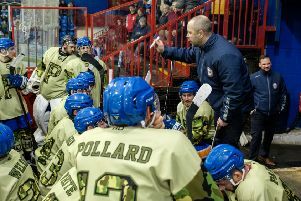 Coach Slava Koulikov dished out the plaudits in the wake of a 2-0 triumph against Hull Pirates at Planet Ice as a game, which could so easily have descended into frustration, ended in satisfaction thanks to two late goals. Phantoms were frequently on the receiving end of trivial calls from fussy referee Stefan Hogarth, yet the same official appeared happy to allow the visitors to leave in sticks and skates on netminder Janis Auzins, and even shove him to the deck. But, as many other teams have found out before them, such treatment doesn’t faze the big Latvian shot-stopper in the slightest – a point proven by a 30-shot shut-out which included a couple of particularly classy saves as Hull threatened in the second period. And Auzins’ brilliance helped ensure Phantoms were in a position to triumph in the final session when they finally managed a breakthrough from the unlikeliest of sources. Robbie Ferrara struck for only the fourth time in more than 300 appearances for Phantoms with a shade under 10 minutes to go. The homegrown defenceman found the top corner with a looping shot from close to the blue line as visiting netminder Jordan Marr’s hopes of a clean sheet of his own were ruined. And a second goal soon followed as Darius Pliskauskas burst onto an Owen Griffiths pass to rifle a finish past Marr. Rather aptly, given Phantoms had spent so much time killing penalties, the Lithuanian international’s effort arrived when his side were short-handed. “Every single guy – whether a netminder, defenceman or forward – was absolutely outstanding,” insisted Koulikov. “We had to fight against a lot of issues and we showed our character to come through the game. “We have had some good wins at home this season, but for many different reasons this was the best performance my team have produced by far. “There are not many teams who will beat us if we can play to this level on a regular basis. “We had to shuffle the lines due to having a couple of important guys missing and had to kill a lot of penalties – a few of which I certainly had a question mark about. “But I was always confident we would get a goal and to score the second so quickly was very welcome. Forwards Marc Levers and James Archer were the influential men who sat out last night’s victory, which kept Phantoms in fifth position in the EPL standings. And they look to have an ideal chance to make further progress with their next four games – spread over the next three weekends – being against the bottom two teams in the second tier. That run starts with a trip to Bracknell this Saturday (November 26) ahead of a home date against Manchester the following night.